It’s surprising how many Finance Directors ask me this question. In my experience, business partnering is a lot more complicated than this. A little bit of ‘new blood’ is probably a good thing, but wholesale change doesn’t work. 1. Permission with your business leaders that it really is the role of Finance to challenge business colleagues to improve the performance of the business. Permission from all the Finance leaders that we really do have the ambition to add more value to the business, and that people will be rewarded for this. Importantly, permission from yourself to have the courage to step out of your traditional Finance comfort zone. It’s less about getting the numbers right and more about expressing your point of view at a business meeting about how to improve the performance of the business. The Inputs, not the Outputs. 2. Capacity in your teams to have time to focus on business partnering. Many companies have reduced costs and freed-up time in Finance through standardisation, shared services and outsourcing. But if you believe this ‘freed-up time’ will automatically lead to better business partnering, you will be deeply disappointed. Freed-up time mysteriously ‘disappears’ in Finance. Where should I spend my time as a business partner? What’s my agenda? How will you measure and reward me? You don’t want business partners messing around with journals, accruals, purchase orders etc. Your ‘financial controllers’ need to be on top of this. What specific things need to change to transform the role of Finance in your company? Neither do you want your management reporting / FP&A teams producing generic reports without understanding what the numbers mean in practice. What’s really happened in the business this month or this quarter? Why’s it happened? And what could you do about it? Business partnering is not just about having great business partners. 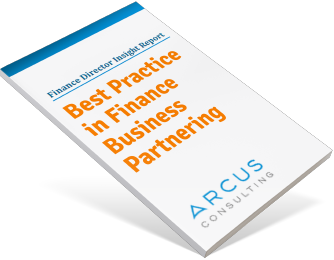 Everyone in the Finance chain needs to be at the top of their game for business partnering to work. Business partners are also in direct control of how to free up their time. How do you manage the demand for your time? Do you prioritise work by value to the business or ‘he who shouts loudest’? Do you respond to every request for data without challenging the need for further analysis? Do you respond to every query as soon as it lands in your Inbox? A smart business partner brushes away immaterial requests for yet more data, and spends 80% of their time working on the key business decisions and actions they know will make a difference to the performance of the business. 3. Capability has two parts: the skills of your teams plus the tools you provide for insightful analysis. Do your teams have the skills to draw out business insight from the numbers? How to grab someone’s attention? How to tell a story to persuade a business leader to change course? How to drive better decisions and actions at a management team table? How to become a trusted advisor? If you’d like to find out more, drop me a note about our tailored training programmes for finance business partners, or take a look back at my earlier blog article on Business Partnering Skills. You also need the right analytical tools in place to derive business insight from the ever-increasing amount of internal and external data. The trick is to start by being very clear about which are the most significant decisions in the business that drive performance, and focus here. Maybe it’s pricing and discounting models? Maybe it’s planning and scheduling of labour or resources? Maybe it’s customer or product profitability? Maybe it’s margin or exchange rate analysis. Whatever the most critical business decisions are, you need effective tools for insightful analysis and decision-support in these areas. And then you need to be able to grab people’s attention, based on that insightful analysis. We call it ‘Decision-Driven Information’. It all sounds simple. And only 3 things to focus on! 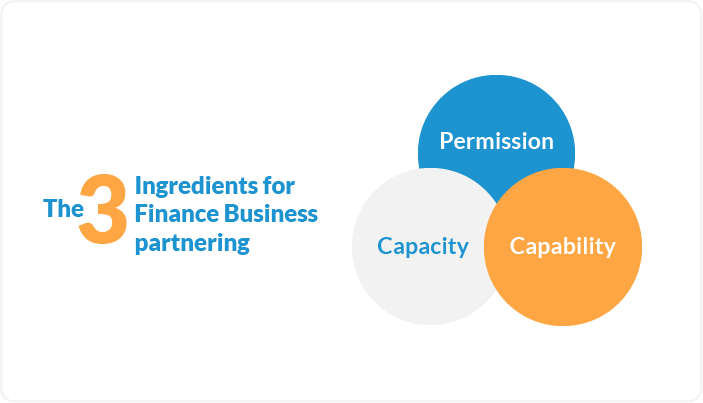 What are the biggest gaps in your Finance teams for Permission, Capacity and Capability? What specific and practical actions are you going to take to close these gaps? We work with a lot of Finance leaders to help to change their organisation and train their teams to be successful at business partnering. So, please get in touch if you’re concerned about how to close the gaps in your Finance teams. Arcus opened my eyes to what needed to change in our organisation to deliver a step-up in the value we deliver to our business. Their style has worked really well for us.